Solid 14k Gold "Any Shape Center Stone" Sculpture Inspired Antique Halo Style Engagement Ring. 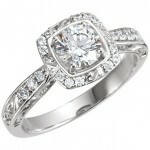 The Halo style ring features Round Brilliant Russian Cubic Zirconia Accent stones, and the Center stone of your choice! We use the best Diamond Grade Mountings for our CZ Stones, in combination with wonderful workmanship you get the most beautiful affordable ring of your dreams! This item is Hand-Carved, Just for you, and takes 7-14 days.